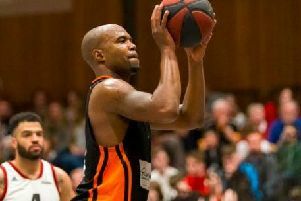 Worthing Thunder fell to their first home loss since January, losing 97-71 season to the Loughborough Riders on Saturday. With members of Worthing FC present Thunder were keen to impress but were unfortunately upstaged by a one-time Brighton college student Lucien Christofis, who led Riders with 26 points. Zaire Taylor paced Worthing with 23 points with Brendan Okoronkwo adding 18 but the hosts had a night to forget, shooting 39 percent from the field, having never taken the lead. In a closely contested first quarter, Worthing couldn’t buy a basket as Loughborough’s advantage grew into double digits, the visitors settling for a 14-point lead at the half. Riders’ lead peaked at 26 points as Thunder’s comeback never got going in the second half as they faded to their first home loss since January when Solent Kestrels came away from the Worthing Leisure Centre with a win. Worthing though remain in second, but tied with Loughborough.